Transcend DrivePro Body 10 1080p HD Video Camera Camcorder with (2) 32GB Cards + 5000mAh Power Bank + Case + Reader + Kit. 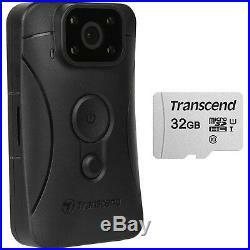 Transcend DrivePro Body 10 1080p HD Video Camera Camcorder. 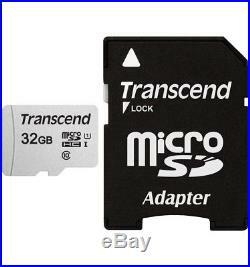 Transcend 32GB microSDHC UHS-I Class 10 U1 Memory Card with Adapter. 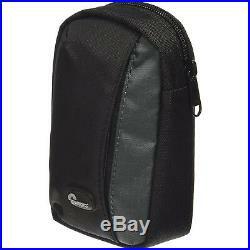 Lowepro Newport 30 Digital Camera Case (Black/Grey). Precision Design 5000mAh Power Bank Portable Charger. 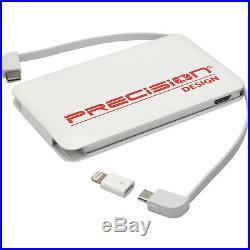 Precision Design SD & MicroSD SDHC / SDXC Memory Card Reader. Precision Design 5-Piece Camera & Lens Cleaning Kit. 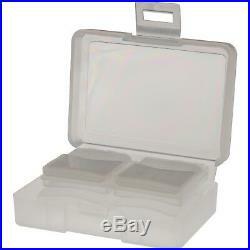 Precision Design 8 SD / 2 MicroSD Memory Card Case. ImageRecall Digital Image Recovery Software. Transcend DrivePro Body 10 1080p HD Video Camera Camcorder with. Day or night, indoors or outdoors, Transcend's DrivePro Body 10 is a great companion for police officers, security guards and other professionals. The camera's wide 130-degree viewing angle , f/2.8 aperture lens and Full HD 1080p recordings ensure all the important details of actions are clearly recorded. The infrared LEDs will be automatically turned on in low light conditions, allowing recording and snapshots at night. The DrivePro Body 10 also features a built-in battery and excellent water and shock resistance , ideal for indoor and outdoor use. Collect Evidence Day and Night: With a large f/2.8 aperture, a wide 130° viewing angle and a high-quality camera lens, the DrivePro Body 10 can automatically adjust to different lighting conditions to capture all details of actions during either daytime or nighttime in clear and smooth 1080p (30fps). In addition, as the infrared LEDs will be automatically turned on in low light conditions, recording at night is now easier than ever before. Sony high-sensitivity image sensor: Transcend's DrivePro Body 10 features a Sony image sensor to capture high-resolution video and photos with superb, rich color. Even in low light, images are highly detailed with low noise and excellent dynamic range. Rugged and durable design: The rugged DrivePro Body 10 provides excellent protection for outdoor recording. IPX4 water resistance offers protection against splashing water from any direction. The DrivePro Body 10 also offers excellent shock resistance, meeting U. Built-in battery: With a built-in Li-Polymer battery, the DrivePro Body 10 can record up to 5 hours of footage on a full charge, mitigating the need for a power adapter for police officers on duty. Quick snapshot button: The quick snapshot function allows users to take photos while recording video simultaneously. During an incident, just reach up and press the snapshot button to capture photographic evidence on the spot. Loop recording: Allows the body camera to overwrite old video files with new ones. TAA compliance: Transcend's DrivePro Body products are compliant with Trade Agreements Act (TAA). DrivePro Body Toolbox: Transcend's DrivePro Body Toolbox is exclusively designed for the DrivePro Body series. It features a user-friendly interface that allows users to securely manage recorded videos and snapshots on Windows PCs. In addition, users can adjust settings for both the Toolbox and the DrivePro Body device, format internal storage, and upgrade the body camera's firmware via the Toolbox. 32GB microSDHC MLC Memory Card Included: The DrivePro Body 10 comes bundled with a Transcend 32GB microSDHC MLC memory card built with high-quality NAND flash, and tested under harsh environmental conditions. Available accessories: The DrivePro Body 10 comes with a 360° rotating clip and a Velcro holder for easy and secure deployment. Transcend also provides a magnetic mount and a MOLLE mount as optional accessories. Transcend 32GB microSDHC UHS-I Class 10 U1 Memory Card with Adapter with. Transcend 32GB microSDHC UHS-I Class 10 U1 Memory Card. Shoot and store more pictures at blazing-fast speeds! Transcend's microSDHC memory cards provide the performance and capacity necessary to harness the full power of your UHS-I compliant digital camera, camcorder, or smartphone. Now you can shoot faster, capture super-smooth digital video, retrieve small pieces of data from random locations and speed up app launch time with read/write speeds of up to 95MB/s and 45MB/s. To deliver the best performance and stability, Transcend's memory cards are tested to withstand extreme conditions. These cards are waterproof (up to 1m for up to 30 minutes), temperature proof (-13° to 185°F), static proof, X-ray proof and shock proof (withstands impacts, vibration and bending). Includes RecoveRx software , a free data recovery utility that allows you to search for traces of erased files including digital photos, documents, music and videos. Supports Ultra High Speed Class 1 specification (U1). Class 10 compliant - Fully compatible with SD 3.01 standards. Smooth Full HD video recording performance. Improved camera response for fast-action consecutive shooting. Built-in Error Correcting Code (ECC) to detect and correct transfer errors. Tested to withstand extreme conditions. Exclusive RecoveRx photo recovery software. 475 minutes of HD video. Lowepro Newport 30 Digital Camera Case (Black/Grey) with. Get essential protection for your camera or smartphone. The Lowepro Newport 30 Digital Camera Case is a compact, lightweight and flexible way to carry your compact camera, smartphone, or other digital device. Sturdy, water-resistant nylon fabric resists moisture and abrasions, and padding keeps your camera safe from minor impacts. A zippered front storage pocket offers a separate compartment with quick access to spare memory cards, a battery, credit cards, or other small personal items. A built-in loop provides an attachment point for a belt or strap for an additional carrying option. Fits: Most compact point-and-shoot cameras or smartphones, plus a spare battery, memory card, and other small items. REAR VIEW W/ BELT LOOP. Fits your compact camera or smartphone. Interior Dimensions (HxWxD): 5.3 x 3.3 x 1.7 in. (8.3 x 4.3 x 13.4cm). Exterior Dimensions (HxWxD): 5.6 x 3.7 x 2 in. (9.3 x 5 x 14.2cm). Precision Design 5000mAh Power Bank Portable Charger with. Precision Design 5000mAh Power Bank Portable Charger with Lightning, USB Type-C & Micro USB Connectors. Extra juice for your portable devices! Elegantly designed, the Precision Design 5000mAh Power Bank Portable Charger packs a punch. This Precision Design Charger is great for charging your iPhone, iPad, Samsung Galaxy, Android, HTC, LG, other smartphones, GoPro, game controller, tablet, digital camera and other digital devices. The Precision Design 5000mAh Power Bank charges your devices quickly and safely via the USB cable. With its built-in USB Type-C , micro USB cable with Lightning connector , it has everything you need! Charges iPhone & Android smartphones, iPad & Android tablets, game controllers, digital cameras, etc. Built-in USB Type-C & micro USB connectors. SIZE COMPARISON TO APPLE IPHONE 8 & SAMSUNG GALAXY S8. 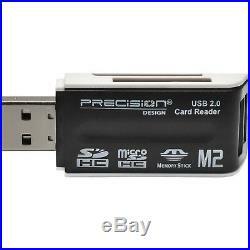 Precision Design SD & MicroSD SDHC / SDXC Memory Card Reader with. Easily transfer files from your SD or microSD memory card. The Precision Design SD & MicroSD SDHC / SDXC Card Reader transfers photos and videos from your SD, SDHC, SDXC, microSD, microSDHC, microSDXC, Memory Stick or Memory Stick Micro (M2) memory card to your computer quickly and easily, without the hassle of connecting your camera to the computer. It provides fast transfer speeds, universal USB 2.0 connectivity, and easy plug-and-play installation. It is compatible with both Windows and Mac , and requires no external power. Compatible with SD, SDHC/XC, microSD, microSDHC/XC, Memory Stick/Micro (M2). Reads and writes data to and from memory cards. 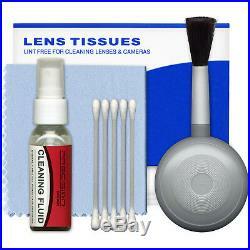 Precision Design 5-Piece Camera & Lens Cleaning Kit with. Precision Design 5-Piece Lens Cleaning Kit. Essential items for the proper maintenance of your equipment. It's obvious that the cleaner the lens, the sharper your pictures will be. Dirt, dust, and fingerprints will degrade the image quality of even the finest optics. However, it's equally important to avoid using incorrect cleaning materials which can permanently damage your photo equipment. This 5-piece cleaning kit contains everything you'll ever need to properly clean your lenses , including a bottle of cleaning solution, lens tissues, cotton swabs, a blower brush, and a microfiber cloth. Precision Design 8 SD / 2 MicroSD Memory Card Case with. Precision Design Memory Card Case. Secure your memory cards and protect your digital photos. The Precision Design Memory Card Case provides protection and durability where it counts, and keeps up to 8 SecureDigital (SD) cards safe from impacts, moisture and other hazards. This tough plastic case also includes two microSD card holders (shaped like standard SD cards) that can be used to securely store these especially small memory cards. 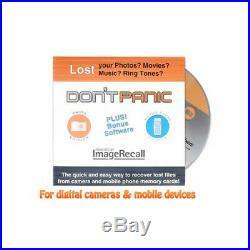 ImageRecall Digital Image Recovery Software with. Recover deleted or corrupted images from your memory cards! ImageRecall is the ultimate quick and easy to use image recovery software. With this easy-to-use program, you can recover deleted or corrupt picture and video files from all types of Memory Cards and USB drives. Users can also scan memory cards for damage, make backups, securely erase cards, and burn recovered files to CD or DVD. Easy to use -- just install the software, insert your memory card, and follow the instructions. Recovers all popular file formats including RAW & JPG. Works with ALL brands and types of memory cards. The item "Transcend DrivePro Body 10 1080p HD Video Camera Camcorder & 2 32GB Cards Kit" is in sale since Wednesday, November 2, 2016. This item is in the category "Cameras & Photo\Camcorders". The seller is "cametaauctions" and is located in Amityville, New York. This item can be shipped worldwide.